Home Companies Shanghai Gaohe Imp. & Exp. Co.,LTD. 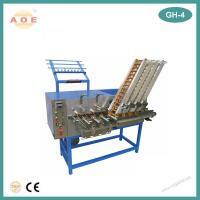 GAOHE is one of the competitive China 4 step full automatic winding machinemanufacturers. We have cheap manual winding machine, toroidal winding machine on sale, and you are welcomed to wholesale products from our factory. Our factory developed a new type computer control 4 step full automatic winding machine used to wind the different size braiding machine bobbins. This 4 step full automatic winding machine can be used to wind 4 bobbins one time and increase the work efficiency. 5, Suitable for all high speed bobbins and some low speed ones. Quality Control: All the machines will be inspected carefully before delivery. Oversea service: We have agent in different countries, so oversea service is available. Packing: The quantity under 10 sets packed in single wooden case, over 10 sets order will load in full container. Delivery Time: Order quantity smaller than 10 sets, delivery time is 20 days; order quantity over 10 sets, the delivery time is 30 days. We provide various solutions for container loading and shipping. various shipping ports give us an opportunity to control all goods through local forwarding companies who provide us good shipping rates. Goods checking on loading can be performed by your request as well.